I wrote Strengthen Your Core for anyone who wants a safe and effective core exercise program. The program uses Plank and Side Plank poses to improve posture, enhance performance, and strengthen from head to toe. The book discusses the theory behind core strength so that you will have a solid understanding of how to build and develop core strength. Detailed descriptions with photos are provided for each of the poses. Four levels are provided to meet your needs: Beginner, Active, Athletic and Elite. I have created a comprehensive resource page for readers with extensive videos describing the key content. Strengthen Your Core is available on Amazon. 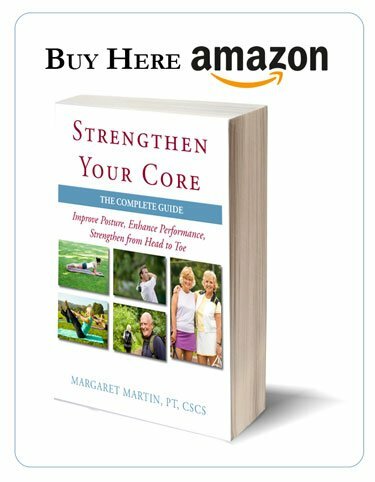 Margaret Martin is the author of Strengthen Your Core. She is a Physiotherapist and Certified Strength and Conditioning Specialist (CSCS) with over 30 years of experience helping individuals achieve their health and fitness goals. She is the recipient of the 2011 Award of Distinction from the College of Physiotherapists of Ontario for her achievements and significant contributions to Physiotherapy. Margaret is the author of Exercise for Better Bones, Strengthen Your Core, and Yoga for Better Bones. She also has developed two online courses for health and fitness professionals, Working with Osteoporosis and Osteopenia and Building a Stronger Core. Her Physiotherapy studio is located in Ottawa. Margaret has combined her years of Physiotherapy experience and her knowledge of strength conditioning and training to write Strengthen Your Core for anyone interested in a core exercise program that improves posture, enhances performance, and strengthens you from head to toe. All of my clients benefit from doing Planks and Side Planks at a level that challenges them. Having taught so many variations of Planks and Side Planks over the years, I realized that knowledge and awareness of the different Plank and Side Plank progressions were not out there—but needed to be. That was my motivation for writing this book. Strengthen Your Core is one of my products.